Fanning out north from Toronto are the Central Counties - York, Durham, and the hills of headwaters - where the region's major watersheds begin. Much of this area spans the beautiful Oak Ridges Moraine. This geologically significant land form is well-known for scenic roads that travel up big hills, around tree-flanked hairpins, and reveal panoramic views of spring-fed rivers and kettle lakes. To the northwest in The Hills of Headwaters, ride out to the meadows and forests of Forks of the Credit Provincial Park. Though motor vehicles are not permitted in the park itself, a short hike from the parking lot will bring you to one of the best access points to the Credit River headwaters, where a stunning set of falls plummets into the gorge. The rural roads surrounding the park wind their way through a variety of hamlets, where you'll want to stop for some grub. Higher Ground in Belfountain is a favourite spot for motorcyclists to gather - word on the street is they have the best coffee around! Just a little further north is the town of Orangeville and its artisan shops and culinary delights. York Region is centrally located due north of Toronto. Toward its northern reach, the headwaters of the Humber River flow through beautiful conservation lands managed by the Toronto Region Conservation Authority. The diversity of their facilities offer everything from interactive tours of pioneer life at Black Creek Pioneer Village, workshops in sustainable living at the Kortright Centre, and the usual fare of hiking and picnic areas. If you're an art lover, the McMichael Gallery in Kleinburg has a spectacular collection of paintings by Canada's renowned Group of Seven painters. To the east, the hamlets and rural roads of Durham are nestled between Lake Ontario, Lake Scugog, and Lake Simcoe. Away from the water, numerous farm stands selling seasonal produce and other scrumptious goods will give you reason to stop, as will the flea markets selling antiques and other odds and ends. The town of Uxbridge, otherwise known as "the trail capital of Canada," is a great place to break for a snack or a meal. I had one of the best ice-cream cones of my life at The Tin Cup Cafe. And every Thrusday night from May 30th to September 5th Haugen's Chicken & Ribs hosts a Motorcycle Cruise-In. They've been at it for years so this is a well-established get together. Perfect for that summer evening ride with good friends and good food. There are also a few shoreline rides for the rider who digs those great big skies. Cruising from Pickering east along Lake Ontario will reveal evermore sublime views of the lake and its laid-back waterfront communities. 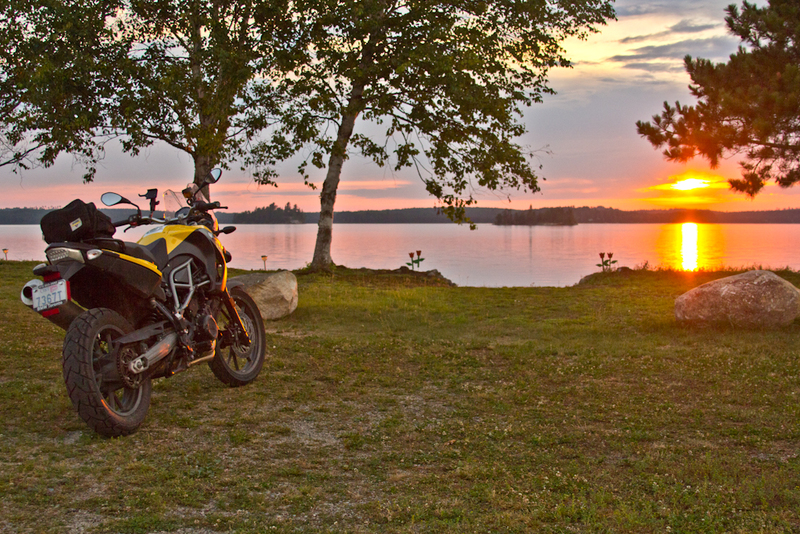 On the eastern edge of durham region, north of Lake Ontario, the area around Lake Scugog possesses some of the most out-there motorcycle roads in the Province. Legend has it that a phantom motorcyclist haunts "Ghost Road" (Concession Road 3) on Scugog Island. Beware! For a less chilling way to spend the evening, dine and dance out on the water with Scugog Island Cruises. From Lake Scugog, the southern shore of Lake Simcoe and its pristine beaches is roughly 30 km (18.6 miles) northwest. Though putting distance on the bike is paramount, keep in mind that Lake Simcoe has some of the best fishing in the area. Rent a boat for the afternoon from one of the marinas in Georgina and spend a few hours angling for that trophy bass. When it's time to park your bike for the night, locations range from urban areas like North York and Oshawa to the small towns and country dwellings you'll pass on your machine. For a more complete list of places to eat, sleep, and play off the bike visit www.centralcounties.ca and OntarioTravel.net's York, Durham and Hills of Headwaters section.